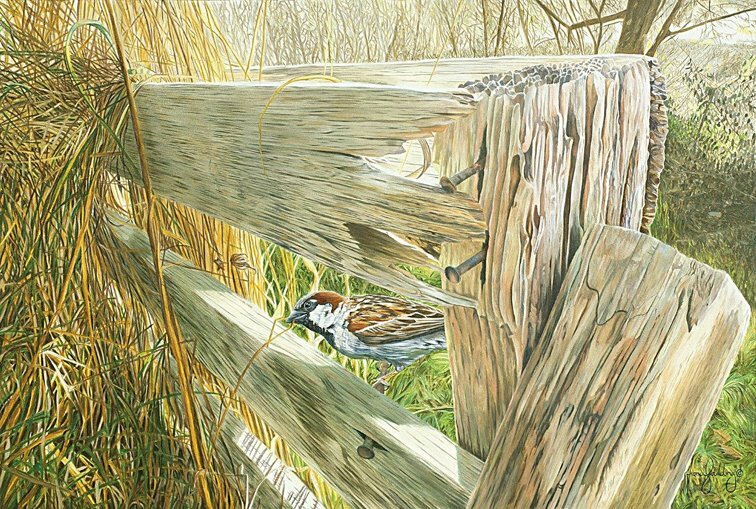 Although not endangered I couldn't resist painting this male house sparrow as it came to forage for nesting materials on a late winter afternoon. The afternoon sun on the fence made a beautiful setting. 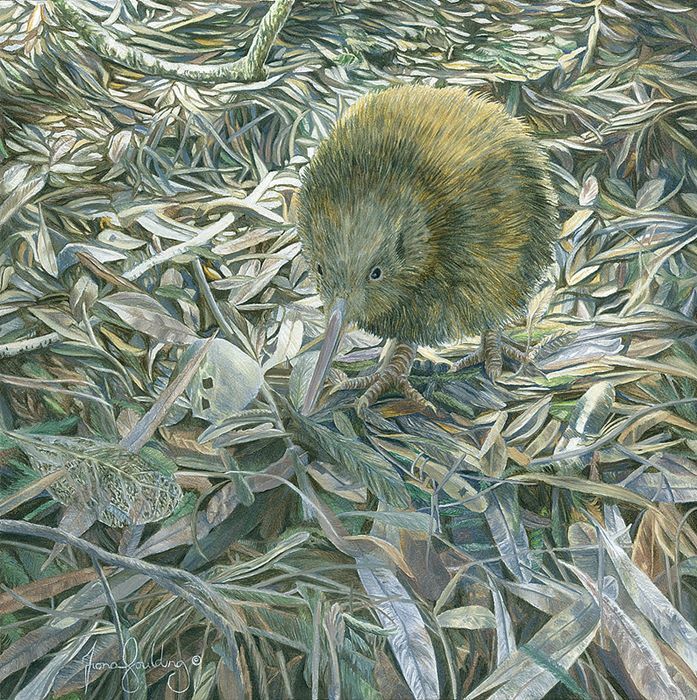 Painted for the International Ornithological Congress exhibition 2018, this painting features the North Island Brown Kiwi which is the only kiwi in the wild in the North Island. It is found in native forest and scrub, pine forests and rough farmland. It is nocturnal and flightless and is therefore vulnerable to mammalian predators, especially dogs, ferrets and stoats. This, together with habitat loss, has led to its decline. The controversial chemical 1080 has slowed or reversed the decline in many areas. Brown kiwi feed by walking slowly along tapping the ground and, when prey is detected, they probe their bill into the leaf litter. An intriguing characteristic is that brown kiwi chicks are never fed by their parents. They first leave the nest to feed when they are approximately 10 days old. This makes them incredibly susceptible to predators. It was this feeling of being alone and vulnerable in the forest at night that I wanted to depict in my painting. 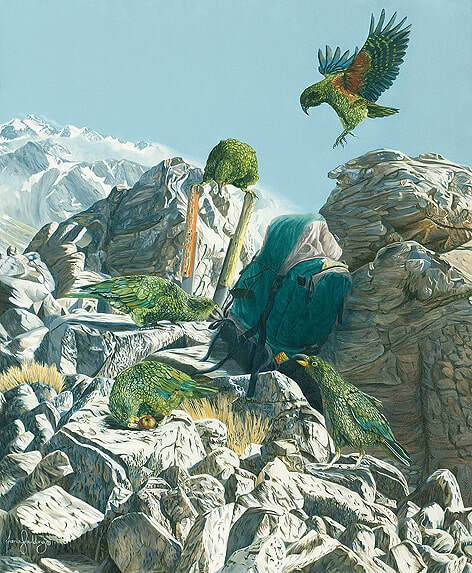 This painting highlights the New Zealand Kea which are found in alpine environments in the South Island, particularly in Arthur's Pass. Mischievous and with an insatiable curiosity for food, shoelaces, car aerials, tyres and windscreen wipers, the kea can be both entertaining and a nuisance! Despite their behaviour and apparent number the kea is declining and is classified as nationally endangered. Their behaviour, and our part in it, is one factor in their decline. Feeding kea for example, whether intentionally or not, is detrimental to them. It stops kea looking for their own natural food sources so they develop a reliance on human food which isn't good for them: chocolate is actually poisonous. However, human development in the alpine region has reduced the sources of natural food available to kea and they find our fat-laden food inviting. In addition to this, kea can die from ingesting lead found in roof flashings, nails and vehicle tyre weights. Other factors in the kea's decline are introduced predators, particularly stoats and possums; accidents with humans and human objects (such as motor vehicles); humans intentionally killing them and, ironically, poisoning from the controversial chemical 1080 which is used to eradicate their predators. This painting shows a flock of kea, known as a Circus, happily exploring the contents of a walker's backpack - an entertaining sight, yet potentially detrimental for the kea, as well as the walker's lunch! Fiona Goulding was born in England. Inspired by voluntary work undertaken in Africa, she spent several years traveling through India, Nepal, New Zealand and Australia. It was the sheer beauty and variety of the New Zealand landscape which drew her to making New Zealand her home. Fiona is entirely self-taught and it is easy to see why her work is often described as 'exquisite'. Her finely executed oil paintings are influenced by the unequivocal beauty found in nature and the connection she feels with this. She loves to get immersed in nature's detail: its sculptural qualities, nuances of colour and affect of light. Although inspired by Realism, particularly the Dutch artist, Gerrit Dou, she prefers her inspiration to come directly from her own findings and responses to her environment. A vegetarian since the age of 5, Fiona is interested in conservation and animal welfare and is the only New Zealand member of Artists for Conservation – the world’s leading artist group supporting the environment. Many of her paintings can be purchased as high quality fine art giclee prints with a percentage of each sale being donated directly to a conservation society. Her current chosen societies are SPCA Otago and SAFE For Animals. "Being able to combine my passion for animal welfare and the natural world with my passion for painting has given me a sense of purpose. Every painting is a lesson for me, not only in technique but in learning more about the subject matter, particularly birds and animals and the threats they face”. Fiona’s work has been exhibited and collected both in New Zealand and overseas. She has won awards and been featured in publications both nationally and internationally.